Welcome to S.A.P. 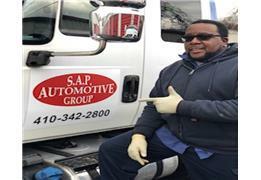 Automotive Group, a full-service preventive maintenance and automotive repair center located in the Canton Industrial area. We are dedicated to providing professional customer service and quality automotive repair. Our goal is to provide our customers with honest service in a timely manner. At S.A.P. Automotive Group, we believe our customers' needs and satisfaction come first. We use the latest diagnostic equipment to guarantee your vehicle is serviced correctly while maintaining your manufacturer's warranty. Our certified technicians complete repairs with quality parts under the direction of our ASE-certified Master Technician.